The groups of nine faculty in IRG 1 (Arratia, Carpick, Durian, Fakhraai, Lee, Riggleman, Turner, Yodh, Liu) are exploring approaches to increase the toughness of disordered materials that are otherwise prone to fail in a catastrophic, brittle fashion. Recent work shows two common indicators of toughness, related to yield-strain behavior and rearrangement size, cannot be easily changed or manipulated to increase material toughness. To further understand toughness of a variety of systems, they looked at two materials properties. 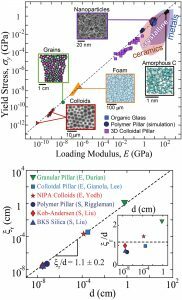 First, yield stress, which is the amount of stress it takes for a material to start to deform permanently. Second, modulus, which can be thought of as a materials stiffness. Fig. 1 (top) shows yield stress vs modulus for disordered solids (IRG 1 data) and crystalline solids. Remarkably, for these vastly different materials, the yield stress is tightly distributed around 3% over 13 decades in modulus. Fig. 1 (bottom) considers the relationship between rearrangement size, i.e. how atoms or particles in a system move when the system is strained, and particle size for 6 systems (3 experimental, 3 computational) spanning nearly 7 orders of magnitude of particle size. Inset shows that the size (exponential length scale) of rearrangements is universally about one particle diameter at low strains. While the microscopic structural features in disordered systems are largely random, these results indicate that surprisingly there may be a universality in the properties of these features. Our team will next learn about how to manipulate the interplay between successive rearrangements, for which machine learning with the concept of softness is our key.